Halloween marks the beginning of one of my favorite seasons of the year. Around here we love the stretch from October 1st (the beginning of Halloween fun in our house) through Christmas! As soon as we turn to October on the calendar, we’re ready to go! Now I don’t go overboard. I’m not talking crazy party planning or decorating that takes days. I’m talking about doing little things and making memories together. 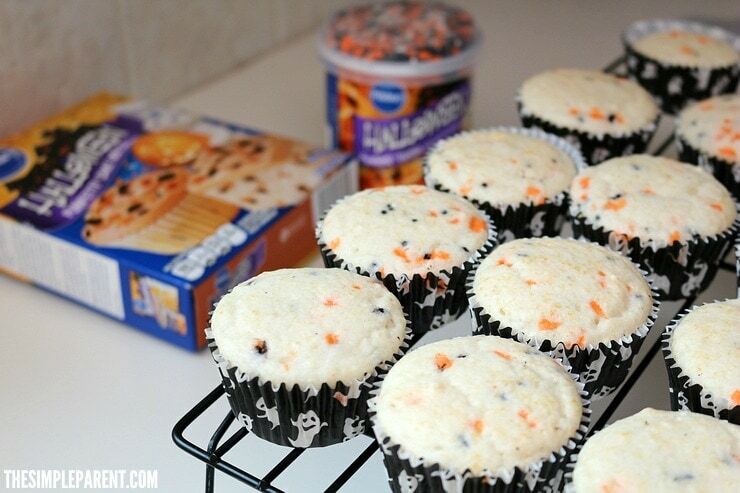 Pillsbury™ Funfetti® Halloween Baking Mixes and Frosting have become a tradition for us. And by making soda cupcakes, it’s a tradition that is quick and easy! 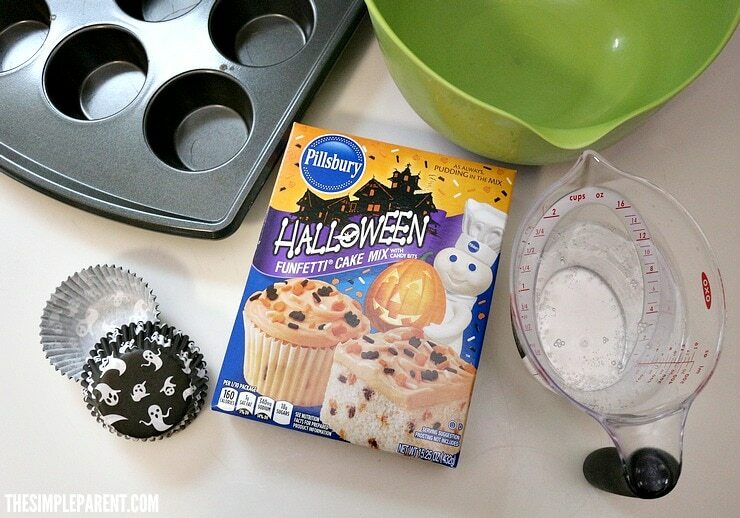 We also love the Pillsbury™ #MixUpAMoment Pinterest board for even more great ideas! Carrigan loves cupcakes and always tries to buy them when we’re at the store. She plays in her play kitchen with the little baking set all the time, so taking her into the kitchen with me to make real cupcakes is our new thing. So when we were picking up groceries on a recent trip to Walmart, it didn’t surprise me when she spotted the Bake Center and was ready to shop! Who could blame her? Halloween plus baking! What’s not to love? 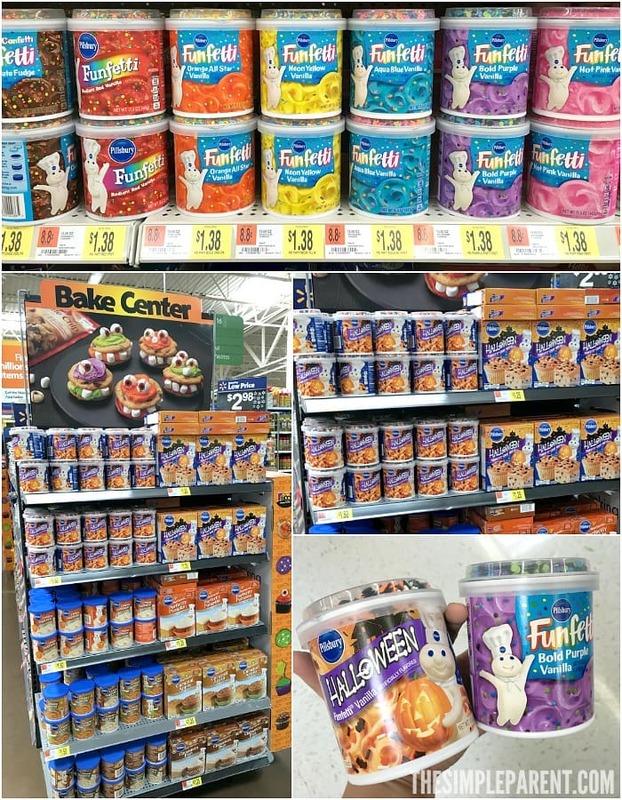 The Pillsbury™ Halloween line can be found at the Bake Center and all other Pillsbury™ products are available in the Bake Aisle so we had to hit that aisle up too! They have some gorgeous colors in the Pillsbury™ Funfetti® frosting! I convinced Carrigan that we needed purple frosting too because I think purple, lime green, and black are perfect for Halloween too! 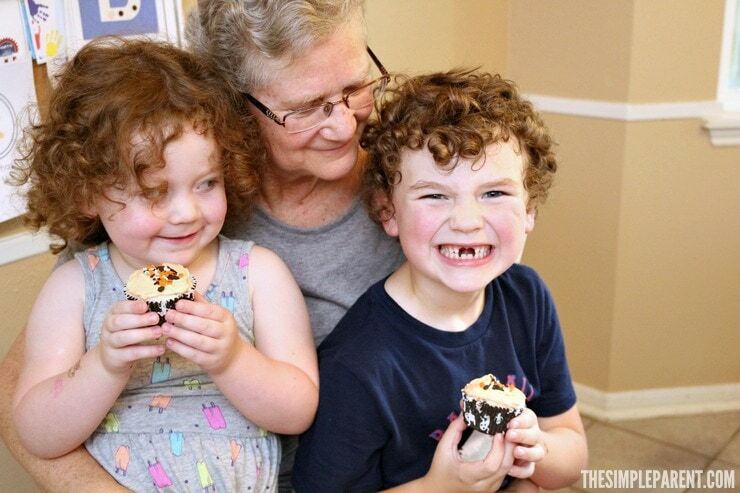 When the kids want to make cupcakes, mom listens! So we picked up what we needed including a few extra decorating items and Carrigan was ready to get home and bake up some Halloween Soda Cupcakes! Heat the oven according to the directions on the cake mix box. In a large bowl, mix together the cake mix and soda until smooth. Allow to cool then frost and decorate. Using soda makes it even easier to prepare and you get some amazingly moist cupcakes this way! It’s one of our favorite ways to make cupcakes. Depending on the flavor of cake you’re making, you can use different flavors of soda that complement the cake. I let Carrigan take over the decorating duty while Weston was at school because she’d been eyeing the sprinkles from the moment we got home! I was overruled on using the purple frosting this time around, but next time I will prevail! How cute would it be to have a mix with the orange and purple frosting? I stashed the purple away. 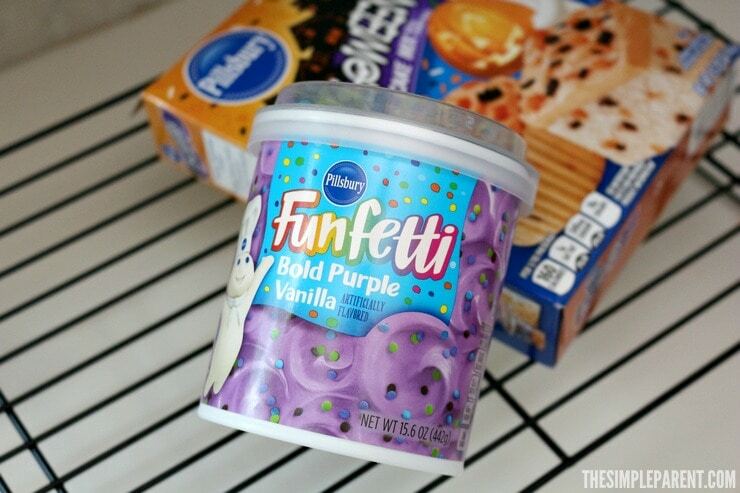 I think it would be fun with lime green Pillsbury™ Funfetti® Cake Mix! It would have a total Frankenstein vibe that I think would be an adorable take on Halloween treats! There is nothing better than taking time to “mix up a moment” with the kids, especially around the holidays. Pillsbury™ Funfetti® Halloween Baking Mixes and Frosting makes it even easier with the easy to make cake mix and frosting complete with sprinkles! My kids love sprinkles so any time we can add them to the mix, it’s sure to be a hit! 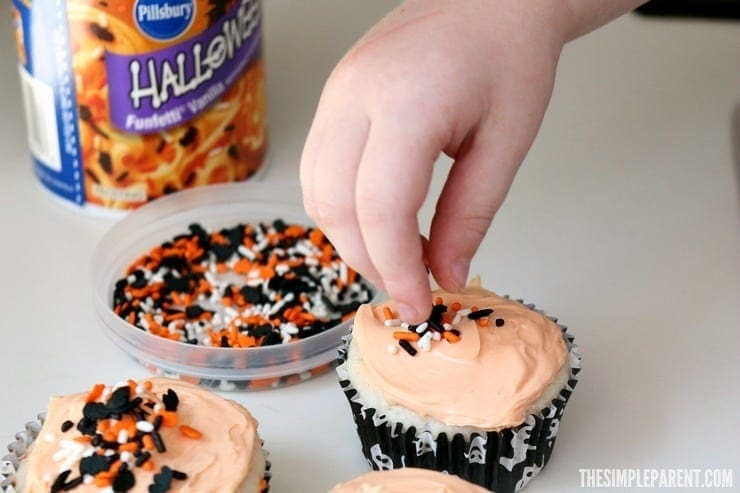 And don’t forget to find more fun ideas on the Pillsbury™ #MixUpAMoment Pinterest board! So many cute ideas! 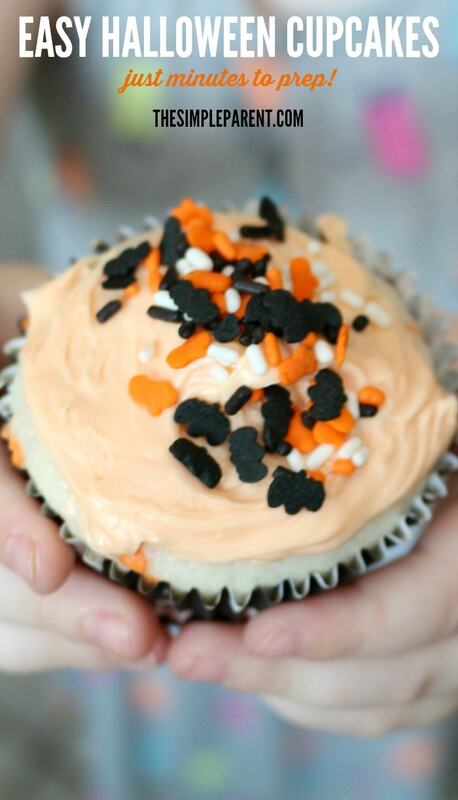 Tons of fun ways to use cake mix once you’re done making Halloween soda cupcakes with your kids!